24th Generation. EDWARD I of England (1239 – 1307), also known as Edward Longshanks and the Hammer of the Scots, was King of England from 1272 to 1307. He married ELEANOR of Castile. The first son of Henry III, Edward was involved early in the political intrigues of his father’s reign, which included an outright rebellion by the English barons. In 1259, he briefly sided with a baronial reform movement, supporting the Provisions of Oxford. After reconciliation with his father, however, he remained loyal throughout the subsequent armed conflict, known as the Second Barons’ War. After the Battle of Lewes, Edward was hostage to the rebellious barons, but escaped after a few months and joined the fight against Simon de Montfort. Montfort was defeated at the Battle of Evesham in 1265, and within two years the rebellion was extinguished. With England pacified, Edward left on a crusade to the Holy Land. The crusade accomplished little, and Edward was on his way home in 1272 when he was informed that his father had died. Making a slow return, he reached England in 1274 and he was crowned king at Westminster on 19 August. Edward’s reign had two main phases. He spent the first years reforming royal administration. Through an extensive legal inquiry, Edward investigated the tenure of various feudal liberties, while the law was reformed through a series of statutes regulating criminal and property law. Increasingly, however, Edward’s attention was drawn towards military affairs. After suppressing a minor rebellion in Wales in 1276–77, Edward responded to a second rebellion in 1282–83 with a full-scale war of conquest. After a successful campaign, Edward subjected Wales to English rule, built a series of castles and towns in the countryside and settled them with Englishmen. Next, his efforts were directed towards Scotland. Initially invited to arbitrate a succession dispute, Edward claimed feudal suzerainty over the kingdom. In the war that followed, the Scots persevered, even though the English seemed victorious at several points. At the same time there were problems at home. In the mid-1290s, extensive military campaigns required high levels of taxation, and Edward met with both lay and ecclesiastical opposition. These crises were initially averted, but issues remained unsettled. When the king died in 1307, he left behind a number of financial and political problems to his son Edward II, as well as an ongoing war with Scotland. Edward I was a tall man for his era, hence the nickname “Longshanks”. He was also temperamental, and this, along with his height, made him an intimidating man, and he often instilled fear in his contemporaries. Nevertheless, he held the respect of his subjects for the way in which he embodied the medieval ideal of kingship, as a soldier, an administrator and a man of faith. Modern historians have been more divided on their assessment of the king; while some have praised him for his contribution to the law and administration, others have criticised him for his uncompromising attitude to his nobility. Currently, Edward I is credited with many accomplishments during his reign, including restoring royal authority after the reign of Henry III, establishing parliament as a permanent institution and thereby also a functional system for raising taxes, and reforming the law through statutes. At the same time, he is also often criticised for other actions, such as his brutal conduct towards the Scots, and issuing the Edict of Expulsion in 1290, by which the Jews were expelled from England. Edward and Eleanor had at least fourteen children, perhaps as many as sixteen. Of these, five daughters survived into adulthood, but only one boy outlived Edward – the future King Edward II. 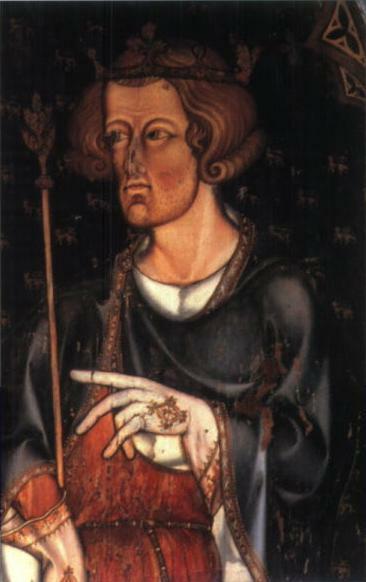 Edward I was reportedly concerned with his son’s failure to live up the expectations of an heir to the crown, and at one point decided to exile the prince’s favourite Piers Gaveston.Edward may have been aware of his son’s bisexual orientation even though he did not throw the prince’s favorite from the castle battlements as depicted in Braveheart. 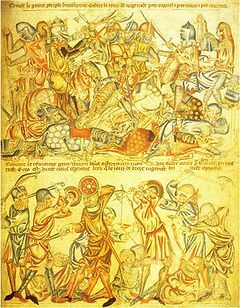 At the Battle of Bannockburn (23–24 June 1314) [a significant Scottish victory and the decisive battle in the First War of Scottish Independence], Humphrey de Bohun should have been given command of the army because that was his responsibility as Constable of England. However, since the execution of Piers Gaveston in 1312 Humphrey had been out of favour with Edward II, who gave the Constableship for the 1314 campaign to the youthful and inexperienced Earl of Gloucester, Gilbert de Clare. Nevertheless, on the first day of the battle, de Bohun insisted on being one of the first to lead the cavalry charge. In the melee and cavalry rout between the Bannock Burn and the Scots’ camp he was not injured although his rash young nephew Henry de Bohun, who could have been no older than about 22, charged alone at Robert Bruce and was killed by Bruce’s axe. On the second day Gloucester was killed at the start of battle. Hereford fought throughout the day, leading a large company of Welsh and English knights and archers. The archers had success at breaking up the Scots schiltrons until they were overrun by the Scots cavalry. When the battle was lost Bohun retreated with the Earl of Angus and several other barons, knights and men to Bothwell Castle, seeking a safe haven. However, all the refugees who entered the castle were taken prisoner by its formerly pro-English governor Walter fitz Gilbert who, like many Lowland knights, declared for Bruce as soon as word came of the Scottish King’s victory. Humphrey de Bohun was ransomed by Edward II, his brother-in-law, on the pleading of his wife Elizabeth. This was one of the most interesting ransoms in English history. The Earl was traded for Bruce’s queen, Elizabeth de Burgh and daughter, Marjorie Bruce, two bishops amongst other important Scots captives in England. Isabella MacDuff, Countess of Buchan, who had crowned Robert Bruce in 1306 and for years had been locked in a cage outside Berwick, was not included; presumably she had died in captivity. Final scene of Braveheart – In 1314, nine years after Wallace’s death, Robert the Bruce, now a king but still guilt-ridden over his betrayal of Wallace, leads a strong Scottish army and faces a ceremonial line of English troops at the fields of Bannockburn where the English are to accept him as the rightful ruler of Scotland. Just as he is about to ride to accept the English endorsement, the Bruce turns back to his troops. Invoking Wallace’s memory, he urges his charges to fight with him as they did with Wallace. Robert’s army then charges the English, who were not expecting a struggle. The film ends with Mel Gibson’s voice intoning that the Scottish won their freedom in this battle. 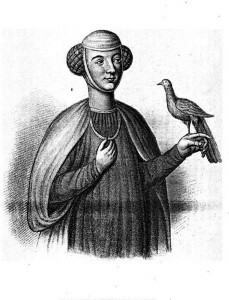 22nd G. Margaret de BOHUN 2nd Countess of Devon (1311-1391) Unlike most women of her day, she had received a classical education, and as a result was a lifelong scholar and collector of books m. Hugh de COURTENAY 2nd Earl of Devon. Courtenay fought with the heroes of Crecy on 26 August 1346 in the famous of the encounters in France. The victory formed the basis for Courtenay’s inclusion as a Knight of the Garter in 1348, by personal invitation of the King himself. Married Elizabeth, relict of Sir John de Vere, son of the Earl of Oxford. She was the second daughter of Hugh, Earl of Devon. Through her sisters, she was closely connected with the Lords Cobham and Harington. On the occasion of the marriage, in the summer of 1359, Edward III gave them an annuity of 200£ for their lives, in aid of the maintenance of their social position. In 1361, Sir Andrew Luttrell and his wife went on pilgrimage to the famous shrine of Santiago de Compostella, with a retinue of twenty-four men and women and as many horses. Dunster Castle is the historical home of the Luttrell family located in the small town of Dunster, Somerset, England.. Colonel Sir Walter Luttrell gave Dunster Castle and the greater part of its contents to the National Trust in 1976. During 2009 it received 134,502 visitors. There has been a castle at the top of the hill at Dunster for more than 1,000 years. The Domesday Book records one on this location before 1066. The castle was granted by William the Conqueror to William de Moyon, whose family lived there until the castle was sold in 1376 by Lady Joan de Mohun to Lady Elizabeth Luttrell. 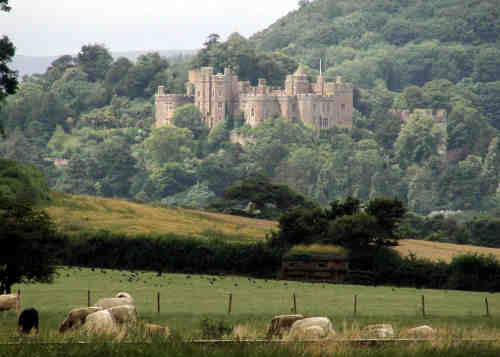 Lady Elizabeth’s descendants owned Dunster Castle until 1976. Served in France with Richard II and Henry IV and held a spectrum of appointments. He was, in succession, Lieut. of Calais, Mayor of Bordeaux 1404, Govenor of Marfluer, and Great Sentinal of Normandy. He was Member of Parliament for Somerset in the reign of Richard II and subsequently for Devon. Esquire to the Household of John of Gaunt, Duke of Lancaster. Keeper of the Forest of Gillingham to Henry IV. Ambassador to a Treaty with France and Burgundy 1403. On the death of his cousin, John, he inherited East Quantoxhead and when Lady de Mohun died in 1404 hastened to pursue his claim to Dunster. He began by dispatching the tenants and moving into the Castle in time to celebrate Christmas 1405. This stung the de Mohuns into action and there followed a scramble for the deeds of title of the Castle entrusted to the Prior of Christ Church, Canterbury. Sir Hugh took the Prior to court and eventually obtained the documents which proved his right to the Castle. The de Mohun coheirs, Edward Plantagenet, Duke of York, the Countess of Salisbury and Lord Strange of Knockin – a formidable trio – argued the validity of the transaction. Sir Hugh was not easily panicked, he won Parliament onto his side and so arranged arbitration by two peers and all the justices. When this failed Parliament insisted the claim should be heard in the ordinary courts before an impartial jury. By this time the de Mohun’s case was wearing thin and they resorted to arguing legal technicalities. It is nevertheless disappointing to find the the story lacks a climax: the case was adjourned in 1407 after the first hearing and was never recommenced. Henceforth, Sir Hugh’s right to Dunster was unchallenged. He worked hard to make his new home habitable and one of his first acts was to install windows in the neat hall and his private quarters. In 1420 work began on the gatehouse, a symbol of property of the newowner of the Castle. Steward of the Household of Queen Joan c1410. Constable of Bristol Castle and Keeper of the Forests of Kingwood and Fulwood c1412. He was afterwards ranger of Blackmore forest in Dorset, a privy councilor to Henry V and on of the commanders under that monarch at the reduction of Harfleur in Normandy in 1415 and at the siege of Rouen. He died while on a visit to his daughter Joan who was a nun at Shaftesbury, Dorset. In Feb 1449 James Luttrell obtained royal license to convey the castle and borough of Dunster, the manors of Minehead, Carhampton and Kilton and the hundred of Carhampton to Feoffees in order they they should be settled on himself and the heirs of his body with remainder to his cousin Richard Luttrell and the heirs of his body and ultimate remainder to his own heirs general. James Luttrell fought against the Duke of York at Wakefield at the end of Dec 1460 and was knighted by the Duke of Somerset on the field of battle. Seven weeks later he again served under the victorious banner of Queen Margaret at the second battle of St. Albans but he there received a wound of which he died on the fifth day. The triumph of the House of York was disastrous to the Luttrells who had been attached to the House of Lancaster ever since the days of John of Gaunt. Within a week of his accession to the throne, Edward IV ordered the sheriff and escheator in Somerset and Dorset to seize all the possessions of the Dukes of Exeter and Somerset, the Earls of Devon, Wilts and Northumberland, Sir James LUTTRELL and Sir Alexander Hody, in those counties. Two months later a somewhat wider commission was issued to Sir William Herbert, Thomas Herbert, John Herbert and Hugh Huntley to take possession of the lands of the Earls of Pembroke and Shrewsbury and Sir James LUTTRELL who were specifically described as rebels. For some unknown reason this commission was repeated in Aug. In the meantime the King had granted to Sir William Bourchier the wardship and marriage of Alexander Luttrell, the infant heir, as if it had fallen to the Crown in the ordinary course. The Parliament, however, which sat in Nov 1461 passed a sweeping ordinance against all the chief supporters of Henry VI. Sir James LUTTRELL was therein named amongst those who ‘with grete despite and curell violence, horrible and unmanly tyrannye’ murdered the late Duke of York at Wakefield and who were consequently to ‘stand and be convycted and attainted of high treason, and forfett to the King and his heires all the castles, maners’ and other lands of which they were or had been possessed. Lady Luttrell had, in the earlier months of her widowhood, been tacitly allowed to receive the issues of the lands settled on her in jointure and when the king’s officers took possession of these lands she lodged a complaint against them protesting that she was a loyal subject of the reigning monarch. A commission of enquiry was accordingly issued in Sep 1462 but it does not appear that she got much satisfaction. 17th G. Sir Hugh LUTTRELL (1447-1521) m. Margaret HILL (or Welthian Yarde) daughter of Robert HILL, and half-sister (maternally) of Lord Daubeney, K.G., and secondly, Walthera, widow of Thomas Drelne.. Mentioned by Hollingshed and other historians amongst the persons of note in the west, who joined the Earl of Richmond at his landing, and were afterwards instrumental in quelling the Devonshire insurrection. When the successful issue of Bosworth placed the crown upon Richmond’s head, as Henry VII, Hugh presented a petition to the King in Parliament setting forth that his father had been attainted ‘for the true faith and allegiaunce which he owid unto the right famous prince of moost blessed memory, then his soveraine lord, Henry late King of England the sixth‘, and praying that the act of attainder should be repealed, and consequent letters patent made void. His petition was readily granted and the agents of the Earl of Huntingdon made way for the rightful lord of Dunster. He was also created a Knight of the Bath at the Coronation of Elizabeth of York, wife of Henry VII, in Nov 1487. When Catalina of Aragon came to England to marryArthur, Prince of Wales, Sir Hugh Luttrell was one of the seven knights who were selected to accompany her. Roger was Bencher of Gray’s Inn. 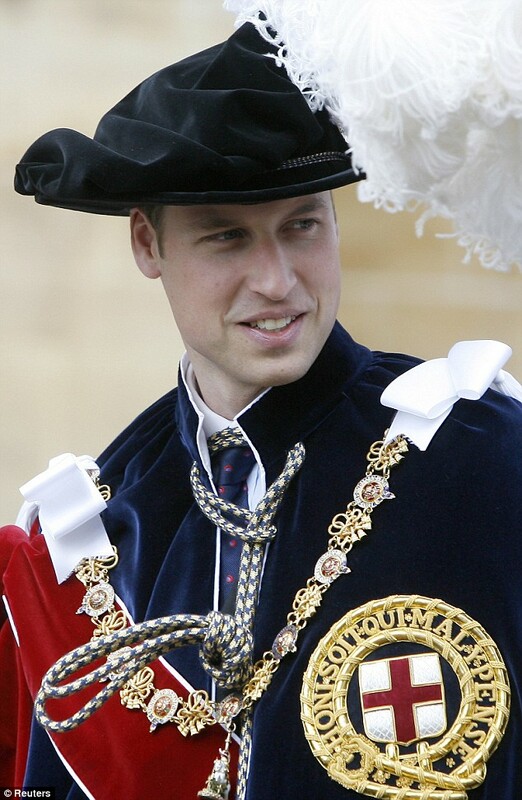 He was a Serjeant-at-Law. The Serjeants-at-Law (postnominal SL) was an order of barristers at the English bar. The position of Serjeant-at-Law (servientes ad legem), or Sergeant-Counter, was centuries old; there are writs dating to 1300 which identify them as descended from figures in France prior to the Norman Conquest. The Serjeants were the oldest formally created order in England, having been brought into existence as a body by Henry II. The order rose during the 16th century as a small, elite group of lawyers who took much of the work in the central common law courts. With the creation of Queen’s Counsel (or “Queen’s Counsel Extraordinary”) during the reign of Elizabeth I, the order gradually began to decline, with each monarch opting to create more Queen’s Counsel. The Serjeants’ exclusive jurisdictions were ended during the 19th century, and with the Judicature Act 1873 coming into force in 1875, it was felt that there was no need to have such figures, and no more were created. The last Serjeant-at-Law was Lord Lindley; on his death in 1921 the order ceased to exist. Here’s our descent from Edward I another way, this time counting backwards! 2. Joan of_Acre PLANTAGENET (1272-1307) m(1) Sir Gilbert “the Red” de CLARE 7th Earl of Gloucester, 6th Earl of Hertford 9th Earl of Clare Kt. (1243-1295)The name “Acre” derives from her birthplace in the Holy Land while her parents were on a crusade.She was married twice; her first husband was Gilbert de Clare, 7th Earl of Gloucester, one of the most powerful nobles in her father’s kingdom; her second husband was Ralph de Monthermer, a squire in her household whom she married in secrecy.Joan is most notable for the claim that miracles have allegedly taken place at her grave, and for the multiple references of her in literature.3. 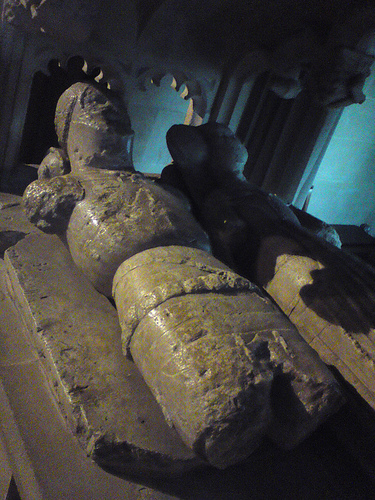 Margaret de CLARE (1292-1342) m(2) Hugh de AUDLEY 8th Earl of Gloucester (1289-1347) Margaret was first married to Piers Gaveston, the favourite (and possible lover) of her uncle Edward II, in October 1307 around the time of her 14th birthday. According to the Vita Edwardi Secundi, this marriage was arranged by the King “to strengthen Piers and surround him with friends.” Gaveston celebrated the marriage with a lavish tournament at Wallingford Castle. The marriage of such a high-born heiress to a foreigner did not please the English nobility and engendered a great deal of unpopularity.They had one child: Joan Gaveston, born probably 12/18 January 1312, at York. King Edward arranged a lavish celebration after the birth of this little girl, complete with minstrels. However, Piers Gaveston was executed only six months later, leaving Margaret a widow with a small child. Her dower rights as Countess of Cornwall were disputed, and so King Edward instead assigned her Oakham Castle and other lands. She joined the Royal household and in 1316 accompanied the King in his journey from London to York.Following the death of their brother, Gilbert de Clare, 7th Earl of Hertford, at the Battle of Bannockburn in 1314, Margaret and her sisters, Elizabeth and Eleanor de Clare received a share of the inheritance. Margaret was now one of the co-heiresses to the vast Gloucester estate, and King Edward arranged a second marriage for her to another favourite, Hugh de Audley, 1st Earl of Gloucester. She was High Sheriff of Rutland from 1313 to 1319. On April 28, 1317 Margaret de Clare wed Hugh de Audley, 1st Earl of Gloucester at Windsor Castle. Hugh and Margaret were among the victims of their brother-in-law, Hugh the younger Despenser. In his rashness and greed for the Clare lands, he robbed Margaret of much of her rightful inheritance. In 1321, Hugh de Audley joined the other Marcher Barons in looting, burning, and causing general devastation to Despenser’s lands which subsequently became the Despenser War. Hugh was captured at the Battle of Boroughbridge in 1322, and was saved from a hanging thanks to the pleas of his wife. He was imprisoned, and two months later Margaret was sent to Sempringham priory. She remained there until 1326, when Hugh escaped prison and she was released from Sempringham. 6. Sir Robert de FERRERS 4th Baron Ferrers of Chartley (ca. 1358 – 1413) m. Margaret DESPENSER (-1415) Robert inherited the title of Baron Ferrers of Chartley upon his father’s death at the Battle of Nájera on 3 April 1367 but was never summoned to parliament. 7. Phillippa FERRERS m. Sir Thomas GREENE V (1399-1461) Philippa and Sir Thomas were 2nd Great Grandparents to Queen consort Catherine Parr, the last wife of King Henry VIII.Maud Green, Lady Parr (1492–1531), the mother of Catherine Parr was a close friend and lady-in-waiting to Catherine of Aragon. Maud’s father Sir Thomas Green VII (1461–1506) was Lord of Greens Norton, Northamptonshire, England. He was the son of Sir Thomas Greene (VI), Lord of Greens Norton, and Matilda Throckmorton who in turn was the son of Sir Thomas V and Phillipa.Thomas VII received Boughton, Greens Norton, and large monetary grants through his inheritance upon the death of his father in 1462. The Green family descended from Alfred the Great, King of Wessex. Thomas was the leading family name making Sir Thomas the seventh in a row to receive the name. The line of Thomas’ started with Sir Thomas de Green, born about 1343. Sir Thomas VII was conservative in religion, quarrelsome, conniving, and was one to take the law into his own hands. Sir Thomas was sent to the Tower of London due to trumped up charges of treason and died there in 1506. The last of his line, Thomas left two motherless daughters who would share the inheritance of their father. 11. Bridget RALEIGH m. Sir John COPE Kt. This entry was posted in Fun Stuff, Line - Miller, Royal Ancestors, Storied and tagged Elizabeth of Rhuddlan, Margaret de Bohun. Bookmark the permalink. Neat stuff. I’ve got 4 Gateway Ancestors including Percival Lowell.